The UNIBUS architecture for DEC’s PDPs and Vaxxen was a stroke of genius. If you wanted more memory in your minicomputer, just add another card. Need a drive? Plug it into the backplane. Of course, with all those weird cards, these old UNIBUS PDPs are hard to keep running. The UniBone is the solution to this problem. It puts Linux on a UNIBUS bridge, allowing this card to serve as a memory emulator, a test console, a disk emulator, or any other hardware you can think of. The key to this build is the BeagleBone, everyone’s second-favorite single board computer that has one feature the other one doesn’t: PRUs, or a programmable real-time unit, that allows you to blink a lot of pins very, very fast. We’ve seen the BeagleBone be used as Linux in a terminal, as the rest of the computer for an old PDP-10 front panel and as the front end for a PDP-11/03. In this build, the Beaglebone’s PRU takes care of interfacing to the UNIBUS backplane, sending everything to a device emulator running as an application. The UniBone can be configured as memory or something boring, but one of these can emulate four RL02 drives, giving a PDP-11 an amazing forty megabytes of storage. The real killer app of this implementation is giving these emulated drives a full complement of glowing buttons for load, ready, fault, and write protect, just like the front of a real RL02 drive. This panel is controlled over the I2C bus on the Beaglebone, and it’s a work of art. Of course, emulating the drive means you can’t use it as the world’s largest thumb drive, but that’s a small price to pay for saving these old computers. Hands up if you feel your spiritual home is in front of a terminal with a “DIGITAL” logo on it. It’s a name that has long ago been subsumed into first Compaq and then by extension HP, but it’s one with a lot of history when it comes to computing. From the start of the electronic computing age, there were the computers we’d probably now describe as mainframes. Big computers that cost the GDP of a small country, filled an entire floor of a building, and could only be found in government departments, universities, and large companies. By the 1960s, the technologies existed to build computers that broke this mould, could be bought within the budget of a smaller organisation, and for which you didn’t need a huge air-conditioned basement to house. These so-called minicomputers were the great revolution of that era because they bought the fruits of computing into everyday business, and probably the most successful of the companies that produced them was the Maynard, Massachusetts-based Digital Equipment Corporation, or DEC.
DEC produced a succession of minicomputers in their PDP line, of which the most successful was their PDP-11 series. These were 16-bit minicomputers that remained in their product line from their launch in 1970 through to the early 1990s, and were available in a succession of configurations and physical form factors. The famous view of a PDP-11 is of a set of floor-to-ceiling racks, but there were also standalone terminal models, and desktop models. One of these, a PDP-11/03 from 1975, has come into the hands of [Joerg], and he’s used it to craft his LSIbox, the PDP11/03 card frame packaged with a BeagleBone for access via a modern-day interface. It’s a build in the vein of modern tube audio amplifiers that feature the retro hardware on the top of their cases, the card frame is exposed as a feature on top of a white case that is featureless except for a genuine PDP-11/03 front panel. You might ask why anyone would do this in order to run PDP-11 software when the BeagleBone could almost certainly emulate the vintage hardware much faster than the real thing. 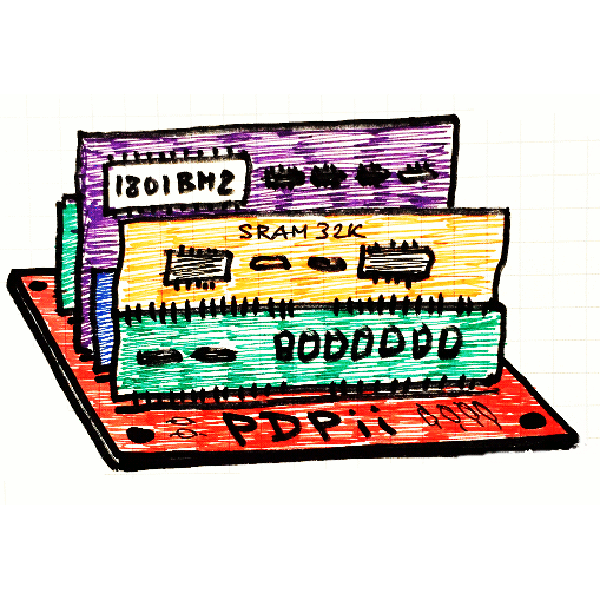 But to take that view is to miss the point; the PDP-11 series are a seminal part of computing history, and to have genuine PDP-11 hardware on your desk is quite an achievement. We’ve shown you a few PDP-11 projects in the past. There was this minimalist PDP-11 implementation using one of the later integrated PDP-11 processors, and we’ve seen a faithful reproduction of an earlier PDP-11 front panel powered by a Raspberry Pi. If you entered the world of professional computing sometime in the 1960s or 1970s there is a high probability that you would have found yourself working on a minicomputer. These were a class of computer smaller than the colossal mainframes of the day, with a price tag that put them within the range of medium-sized companies and institutions rather than large corporations or government-funded entities. Physically they were not small machines, but compared to the mainframes they did not require a special building to house them, or a high-power electrical supply. 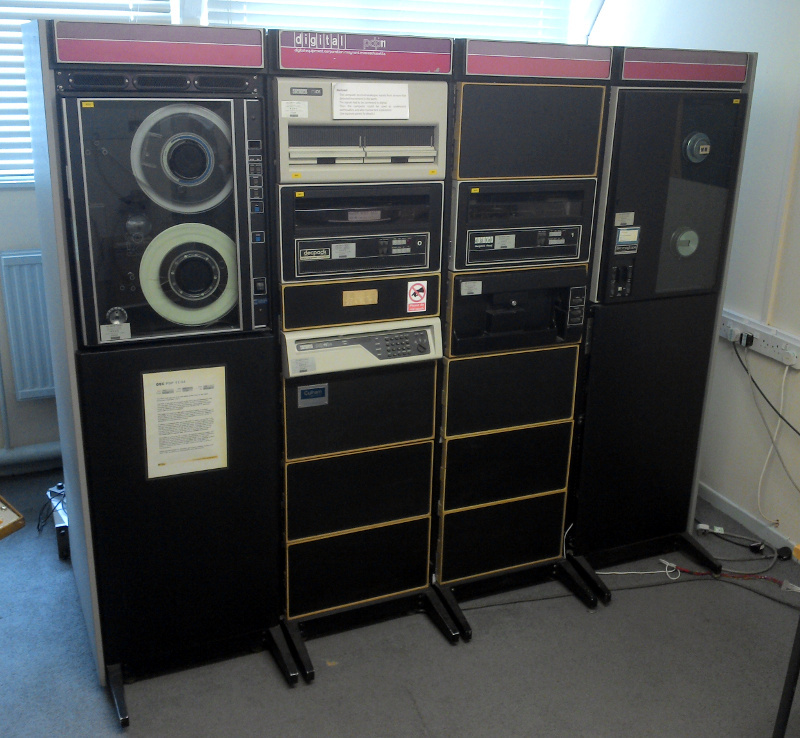 A PDP-11 at The National Museum Of Computing, Bletchley, UK. One of the most prominent among the suppliers of minicomputers was Digital Equipment Corporation, otherwise known as DEC. Their PDP line of machines dominated the market, and can be found in the ancestry of many of the things we take for granted today. The first UNIX development in 1969 for instance was performed on a DEC PDP-7. DEC’s flagship product line of the 1970s was the 16-bit PDP-11 series, launched in 1970 and continuing in production until sometime in the late 1990s. Huge numbers of these machines were sold, and it is likely that nearly all adults reading this have at some time or other encountered one at work even if we are unaware that the supermarket till receipt, invoice, or doctor’s appointment slip in our hand was processed on it. During that over-20-year lifespan of course DEC did not retain the 74 logic based architecture of the earliest model. Successive PDP-11 generations featured ever greater integration of their processor, culminating by the 1980s in the J-11, a CMOS microprocessor implementation of a PDP-11/70. This took the form of two integrated circuits mounted on a large 60-pin DIP ceramic wafer. It was one of these devices that came the way of [bhilpert], and instead of retaining it as a curio he decided to see if he could make it work. The PDP-11 processors had a useful feature: a debugging console built into their hardware. This means that it should be a relatively simple task to bring up a PDP-11 processor like the J-11 without providing the rest of the PDP-11 to support it, and it was this task that he set about performing. Providing a 6402 UART at the address expected of the console with a bit of 74 glue logic, a bit more 74 for an address latch, and a couple of 6264 8K by 8 RAM chips gave him a very simple but functional PDP-11 on a breadboard. He found it would run with a clock speed as high as 11MHz, but baulked at a 14MHz crystal. He suggests that the breadboard layout may be responsible for this. Hand-keying a couple of test programs, he was able to demonstrate it working. We’ve seen a lot of the PDP-11 on these pages over the years. 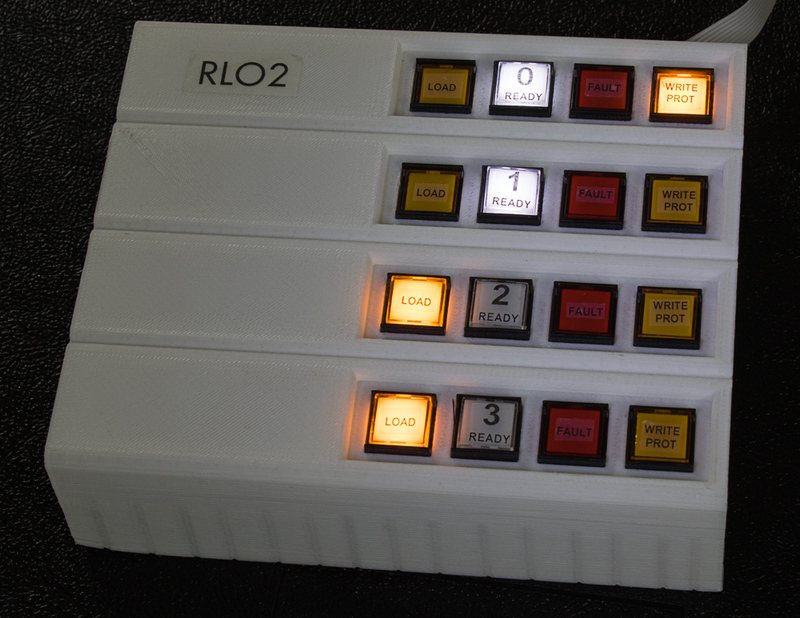 Of note are a restoration of a PDP-11/04, this faithful reproduction of a PDP-11 panel emulated with the help of a Raspberry Pi, and an entire PDP-11 emulated on an AVR microcontroller. We have indeed come a long way. Thanks [BigEd] for the tip. [MattisLind] spent one and a half years to complete restoration of a Digital Equipment Corporation (DEC) PDP-11/04 including peripherals like a TU60 tape drive and a LA30P Decwriter printing terminal. The computer is now able to run CAPS-11 which is a very simple operating system and also CAPS-11/BASIC. Just like the project itself, his blog post is quite long filled with interesting details. For a tl;dr version, check the video after the break. This system originally belonged to Ericsson and [MattisLind] received it from Ericsson computer club, EDKX. He was lucky to have access to online resources which made the task easier. But it still wasn’t easy considering the number of hardware faults he had to tackle and the software challenges too. The first task was obviously looking at the Power supply. He changed the big electrolytic capacitors, and the power supply seemed to work well with his dummy load, but failed when hooked up to the backplane of the computer. Some more digging around, and a replaced thyristor later, he had it fixed. The thyristor was part of a crowbar circuit to protect the system from over-voltages should one of the main switching transistors fail. With the power supply fixed, the CPU still wouldn’t boot. Some sleuthing around, and he pin pointed the bus receiver chip that had failed. His order of the device via a Chinese ebay seller was on the slow boat, so he just de-soldered a device from another board which improved things a bit, but it was still stuck in a loop. A replacement communications board and the system now passed diagnostics check, but failed memory testing. This turned out to be caused be a faulty DIP switch. He next tackled all the software challenges in getting the CPU board up to speed.